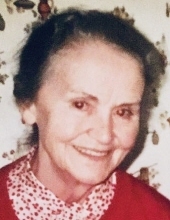 Mary Fadian Kearns, 98, passed away on February 8, 2019. She was born August 1, 1920 in the village of Cashel, on Achill Island, Co. Mayo, Ireland to John and Mary Gielty Fadian. She bravely moved to England in her very early teens to find work so she could send money home to her family. After several years as a maid servant, she was able to attend Queens Park Hospital School of Nursing in Blackburn, Lancashire, England where she became a registered nurse. She and Joseph C. Kearns were married in 1946 and settled in Nelson, Lancashire, where their daughters, Maureen and Jean, were born. In 1957, the Kearnses immigrated to the US and lived for many years in OLA parish. Mary earned her GED then passed her State Boards, and worked as an RN at Fairview Hospital for decades, becoming head nurse on her floor some years before she retired. Mary was pre-deceased by her parents, brothers John and Michael, husband Joe, daughter Maureen Kearns Garabis, and son-in-law Francisco Garabis. She is survived by her daughter, Jean Kearns Miller (Bernie) of Michigan, and brother, Seamus Fadden, of Castlebar, Co. Mayo, Ireland, 11 grandchildren: Dr. Francisco (Carrie) Garabis, Andres Garabis, Maria (Chris) Davis, Ana (T. J.) Wichmann, Elena (Chris) Dubas, Dr. Rafael (Dr. Lauren Waltersdorf) Garabis, Lucia (Luke) Perez, Miguel Garabis, Antonio Garabis, Adrian Miller, and Cassandra (Robert) Isley; and 16 great grandchildren with two more to be born this month. . Mary will always be remembered for her amazing strength and indomitable spirit. Among our thousands of memories, we fondly remember the way she made Thanksgiving dinner in the tiny kitchen of her tiny house for 17 people: herself and Joe, daughters and sons-in-law, and 11 grandchildren. She would accept help from nobody because it gave her pleasure to plan the event and pull it off. One year she broke her wrist so her daughters tried to talk her out of cooking, but she would have none of it. She was all the more determined and managed the dinner literally single-handedly. She was a much loved force of nature and we will miss her greatly. Funeral Mass at St. Bernadette Church, 2256 Clague Road, Westlake, Saturday, February 16 at 10 AM. Interment Holy Cross Cemetery. FRIENDS MAY CALL IN THE MCGORRAY-HANNA FUNERAL HOME OF WESTLAKE, 25620 CENTER RIDGE ROAD (WEST OF COLUMBIA) FRIDAY 5-7 PM. In lieu of flowers, donations are suggested to Saint Joseph Academy, 3430 Rocky River Drive, Cleveland, OH 44111. "Email Address" would like to share the life celebration of MARY FADIAN KEARNS. Click on the "link" to go to share a favorite memory or leave a condolence message for the family.